Just a "soup" you say? Let me assure you, this soup is a meal in itself! And, it cures everything from the common cold to a broken heart, too! Each year when the colder weather comes, one of the first things I think about is making a huge pot of this magical elixir. Since they were younger, my kids have dawdled around the kitchen when they know this soup is simmering, just waiting for me to say the magic words, "Dinner's ready!" ...just like I did when I was a kid and my mom was making it. Warning: Fighting over the meatballs is common. 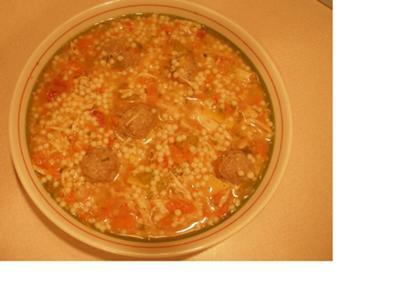 Place first 10 ingredients in a large soup pot and cover with water up to an inch of the rim. Bring to a boil and simmer for about an hour. Make meatball mixture and form into one inch meatballs. After the hour, remove chicken to a plate to cool. Remove carrot chunks, mash with a fork and return to pot. Add the diced tomatoes and the meatballs. Remove skin from chicken, pull meat off the bones, rip into bite-sized pieces, and return to pot. Simmer another 15-20 minutes until meatballs are cooked through. In a separate pot, cook the Acini de Pepe according to package directions. Do not drain! Mix some of the soup mixture with a ladle of the pasta /cooking water mixture. Serve with a generous amount of grated Parmesan or Pecorino Romano cheese. NOTE: Mix the pasta w/ water together with the remaining soup before storing the leftovers - if there are any!!! Sounds wonderful ... can't wait to make it! So easy even I could make it, now to get that chicken! I HAVE WELL OVER 25YRS IN THE RESTAURANT INDUSTRY. IN RESTAURANTS WHERE YOU HAVE TO DO FOOD PREP FOR THE NEXT DAY PART. THAT'S HOW YOU KEEP IT FRESH. I WAS BLOWN AWAY THAT THE RECIPE WAS EASY TO FOLLOW AND WAS FABULOUS. I WISH I COULD HAVE IT MADE BY THE PERSON THAT SUBMITTED THE RECIPE. MY MOUTH WATERS FROM EXPERIENCE AND IMAGINATION . 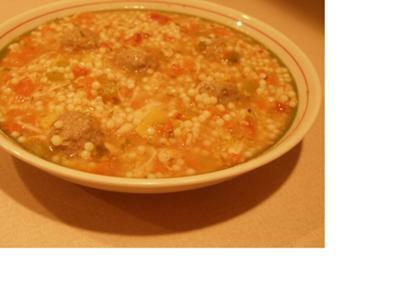 A great recipe and a delicious soup....great for a cold winter day. With the cold weather close soup is a staple in my house. This is one to try! Simple and Italian! This is, hands down, the best chicken soup I have ever had! I might have to make a few extra meatballs since they seem to be everyone's favorite part. Adding a sprinkle of Parmesan cheese on top just sends me right over the edge. It doesn't matter if you have it for breakfast, lunch, or dinner. Pure awesomeness anytime of a cold Winter day! Just a note that four comments were deleted due to duplicate IP addresses. This is just a reminder that according to the "Official Rules" only one comment per IP address (computer) will be counted. I can tell by the list of ingredients and directions to prepare that is a true Italian dish like my parents would make. It?s always just so hard to guess at the proportions they would use. This recipe seems to be right on, I?m definitely giving it a try! The best soup! IT was yummy! Thank you for a great cure for the common cold! 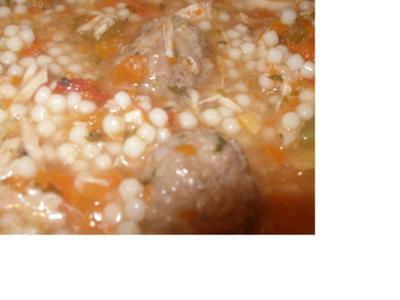 Interesting twist to a traditional soup with Meatballs! Very easy recipe to follow and the closeup picture looks delicious!